The Mega Par Profile System is a exciting all-in-one LED Par system for any mobile entertainer. 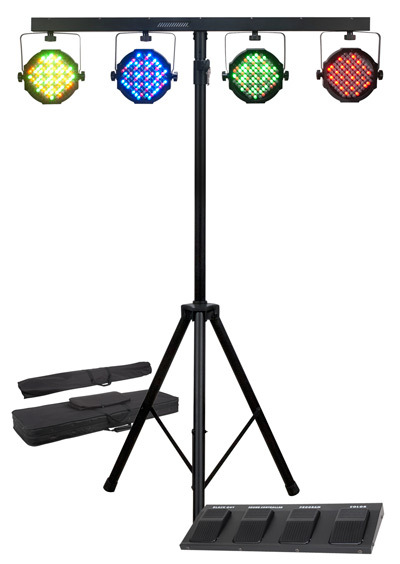 This lighting system features four RGB color mixing LED fixtures. SKU: meg740 system. Category: Stage Lighting. The Mega Par Profile System is a exciting all-in-one LED Par system for any mobile entertainer. 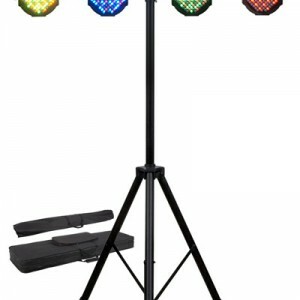 This lighting system features four RGB color mixing LED fixtures. 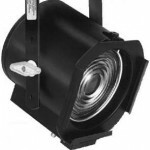 Each fixture uses 109x 10mm ½-Watt LEDs producing bright color washes of light with LEDs rated at an extremely long life of 50,000 hours.Great for any performer on-the-go, the Mega Par Profile System is easy to set-up and take down. Plus, with low heat emitting LEDs performers stay cooler on stage. The system includes a easy-to-set-up tripod stand and two gig bags to help protect your equipment.System includes:• 4x LED Wash Fixtures • 1x Foot Controller • 1x Lighting Stand • 1x Stand Bag • 1x Soft case for lighting systemFeatures: • Ultra bright slim flat wash fixture with 109 10mm LEDs, 436 total system LEDs (104 Red, 184 Green, & 148 Blue LEDs) • Durable black plastic casing • Smooth RGB Color Mixing (fast or slow color change operation) • Great for performance stages where conventional stage lighting emit heat onto performers • 6 Operational modes: Static Color, Manual Dimmer Color, Built-in Programs, Auto Run, Sound Active & DMX-512 • 11 Built-in Programs • 3 DMX Channel modes: 6, 12 and 15 channel modes • Digital DMX Display with 4-button menu for easy navigation • 3-Pin DMX In/Out • DMX-512 protocol • Color strobe effect • Electronic Dimming: 0-100% • Long Life LEDs (50,000 hrs.) • Power Draw: 50 W Max (entire system) • Compatible with ADJ RFC wireless remote (sold separately) • Multi-voltage operation: AC 90V-240V 50/60Hz (IEC Input) • Dimensions (LxWxH): 47.25”x11”x2.5”/ 1220x280x60mm • Weight: 12 lbs./ 5.1 kg.